The exchange of documents is essential to how daily business activities are conducted, especially in manufacturing and distribution. In fact, how well an organisation optimises document processes directly impacts profitability. This is especially true in the food and beverage industry, where FDA regulations and product shelf life make efficiency and accuracy particularly important. It is also true then that the promised gains from automation are often amplified in this space. The struggles associated with manual processing affect a business at multiple levels —, particularly at the managerial level. When document entry cycle times are long, managers cannot grow the business without adding staff. Additionally, there is no easy way to prioritise and monitor document entry, meaning high-priority and time-sensitive processing can be delayed. Document processing errors are also a common problem that causes a domino effect of issues for managers. Errors can lead to delays in fulfillment and cash collection, additional shipping costs, waste (especially with perishables) and repetition. Furthermore, processing errors can cause returns, which a business must pay off in credit notes, restocking or write-offs. Finally, archiving poses a major concern for management. The cost of printing and the space to store documents, combined with the time it takes to file and retrieve records, can hold a company back. Customer Service Representatives (CSRs) are often unable to find documents to answer customer questions, and information is not readily accessible for auditing purposes. Cost-effective integration of incoming documents into business processes so they get to the right places/people as quickly and efficiently as possible. Removal of human intervention and manual paper handling from document processes, increasing efficiency and reducing errors from manual touch points. Increase in the efficiency of back-office operations frees staff to focus on higher value, strategic activities. Improvement of supplier and customer relationships by creating a superior, more efficient experience receiving payment or products. If a manufacturer or distributor in any industry makes a mistake with an order, it incurs costs associated with bringing the product back to the warehouse, repackaging it and redistributing it. There are the shipping costs, the time wasted on duplicate processes and the incurred risk to reputation to think of. 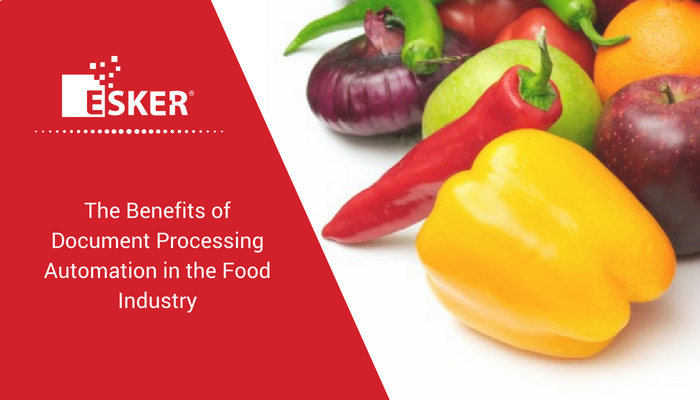 But when it comes to the food and beverage industry, order processing takes on an even greater importance because in many cases, product cannot simply be reshipped in case of error. Perishable product must be disposed of, which can lead to a total loss of revenue on inventory. That’s a cost no company wants to pay. The Bel Group is a worldwide leader in branded cheeses with operations in 36 countries and more than 12,000 employees. Its Spanish operations were hamstrung by inefficient, manual processing of customer orders and invoices. Prior to implementation of an automated order processing system, two-thirds of the approximately 25,000 customer orders the division received annually came in via fax, email, and telephone. Processing those orders manually was slow, labor-intensive and much more susceptible to error. Like many companies with traditional systems and long-standing customer relationships, Bel Spain worried that their customers would balk at submitting orders electronically. Since solution implementation, Bel has taken an active role in helping customers change the way they send documents, moving from telephone and paper to electronic format (fax or email). Within a year, two-thirds of Bel’s orders were being received electronically. Thirty percent of those were processed using optical character recognition (OCR) technology, drastically reducing the number of manual touch points—and opportunities for error—associated with their traditional system. Today, 100 percent of Bel Spain’s document exchange with customers using non-electronic formats is automated and seamlessly integrated with SAP. Orders are now more accurate, and the company has seen significant improvements in the quality of managing order-to-cash and procure-to-pay cycles. Achieved significant financial savings by eliminating the costs involved with printing and mailing invoices and manual reception and processing of customer orders. Decreased order and invoice processing time. Eliminated processing errors associated with manual handling. Streamlined relationships with vendors and customers by making communication with both more reliable, resulting in faster sales cycles and increased customer loyalty. Eliminated physical archiving by using 115 fewer filing cabinets every year, resulting in an estimated savings of €4,500 per year based on the average price per square meter. Bel Spain also automated the sending and archiving of electronic customer invoices. Invoices are now received quicker and easier, and never get lost. Duplicate copies can easily be printed if needed, there is greater invoice traceability and Bel Spain benefits from decreased days sales outstanding (DSO). Invoices with electronic signatures are automatically generated from SAP. Signed PDF invoices are automatically sent by email via Lotus Notes. Electronic invoices are archived online, freeing-up physical space and decreasing associated costs. Increasing industry pressures have many food and beverage companies looking for ways to lower operational costs and gain leverage with suppliers. The expense and inefficiency of keying in, verifying and approving vendor invoices manually make accounts payable automation a popular way to modernise AP processing, reduce costs and improve vendor relations. International pork processing company Farmland Foods processes about 30,000 invoices every month. That’s an awful lot of paper to push via outdated manual processes. AP operations were frustratingly slow, and the accuracy rate wasn’t where it should have been for a company of Farmland’s standing. Invoices were stored in paper files in an inconvenient storage room, and employees were wasting too many hours printing invoices and manually re-entering them into SAP. In 2014, the company decided to implement an automated AP system that integrates with SAP. As a result, the Farmland experienced tangible cost-savings. Improved visibility. Managers now have access to key metrics, such as number of invoices to process, how far out they are, payment terms for discounts, etc. Easier access to invoices. Instead of tracking down invoices in a file room, Esker allows users to access them via document numbers to easily email/print a copy online. Faster freight processing. Esker helped Farmland reduce its “out period” for freight invoices from a deadline-pushing 14 days to just two days. Cost savings. Fewer manual processing tasks allowed Farmland to save on costs equal to three FTEs, and reallocate current staff to projects offering greater value. Faster invoice entry time. Where the invoice entry goal for Farmland’s AP staff used to be 150-200 invoices per day, they are now achieving over 400 invoices per day. Fewer outstanding accruals. Faster invoice entry times have enabled Farmland to reduce the number of outstanding AP accruals by $8 million. Increased discounts. When comparing the last six months to the six months prior to automation, Farmland estimates it has gained an additional $29,815 in discounts.